In my previous post, I shared a few examples from my personal life that illustrate how customer experience has become critical to our purchase decisions and how brands are using this as a tool for customer acquisition, retention, loyalty and advocacy. The examples I described covered multiple aspects of Customer Experience – interaction with different representatives of the brand, customer orientation and service. In addition to these aspects in the last post, customer experience also includes the shopping environment. Maruti Suzuki has always been associated with offering value for money, fuel-efficient cars. This leading car brand in India has had strong offerings in the entry-level vehicles segment and has effectively targeted first-time buyers. However, despite repeated attempts, the brand was unable to make a mark in the mid and top segment of the car market. With the introduction of Nexa in mid-2015, the brand intended to attract a different set of aspirational buyers – third-generation car buyers who are well informed and well travelled – by offering a premium customer experience in all aspects, one that went far beyond offering a superior car and looked at car buying in a holistic manner. The Nexa experience was designed as a premium retail network offering a unique car buying and ownership experience, built on pillars of innovation, technology and pampering. Apart from offering a more premium product, it focused on a premium buying experience in an exclusive environment while focusing on hospitality, and building a strong relationship with consumers for the entire duration of the ownership of their car. Product, they took care of – the first car to be launched was the S-Cross, which was well styled, on-trend and loaded with features which one wouldn’t expect in a traditional Maruti. This was followed by the launch of Baleno, Ciaz & Ignis – all of which have advanced technology, superior features, and top-end styling and feel. Environment was a key focus area – while traditional Marutis were sold in plain jane, no–frill showrooms, the Nexa showrooms were designed to give an exclusive feel – black and white interiors, luxury lounges, infotainment systems, professional spotlights, the works! They were not benchmarked against car dealerships, but instead to luxury stores, 5-star hotels, aviation and banking experiences. For example, they drew upon the idea of relationship managers (RMs) typically found in banks and made their salespersons RMs who would build a relationship over the course of the ownership of the vehicle. They also started associating with fashion shows and music concerts to project the brand in a younger, more premium light. Maruti was able to attract new consumers to its brand – over 50% of consumers who come to Nexa showrooms are car owners who have never owned a Maruti Suzuki vehicle before and for whom Maruti wasn’t even in the consideration set due to its mass image. About 51% of consumers who come into a Nexa showroom end up buying a car from there. Today, Nexa has built a strong 3,00,000 customer base. Maruti has moved from a 46% market share in FY15 to 51% in FY17. Nexa contributes ~25% in value terms and 15% in volume terms to the total sales of the company, and has been able to achieve this three years ahead of schedule. To extend the Nexa experience further, Maruti has recently rolled out Nexa Service – premium workshops designed especially to cater to customers opting for products from the Nexa brand, equipped with high level of automation, premium lounges, online appointment facilities, status updates, etc. Having read so much about it, I decided to visit a Nexa showroom in order to see whether all the hype was true. The experience was impressive, to say the least. The showroom had a very sophisticated, premium feel – elegant, monochromatic interiors, dedicated waiting areas and enclosed spaces for customer interactions, and the space had an intuitive flow. There was remarkable use of technology throughout the space – the waiting lounge had flat screens with information about not only their own cars but also about competitor brands, tablets were used to walk us through the features of the car on the shop floor. It was a paper-free environment, where all information was captured and shared digitally – KYC forms, details of the car I looked at, specific customizations that I had requested and price quotes. Also impressive were the salespersons who were sharply dressed and well spoken; during the entire interaction it was remarkable to see how well versed they were with the product features and the ease with which they used technology to showcase them. After this experience, the brand image is no longer fuddy-duddy; instead it is young, current and on-point. I would definitely be excited to consider the brand next time I am looking to buy a car. Several brands, like Maruti, have understood the power of customer experience and are committing themselves to enhancing this in their own ways. Can you think of any examples of brands that have taken big strides towards customer experience? Do share your thoughts. Launched in 2009, the Tata Nano was supposed to be ‘a people’s car’, the savior of the Indian middle class family which relied on a scooter or bike to transport all four members, offering them a safer and more comfortable alternative. To ensure affordability, the initial price was brought down to as low as Rs. 1 lakh per car through frugal innovation. Watch this ad to get a taste of what this brand was supposed to stand for and the role it was expected to play. However, most of the hype around the car was focused on its cheap price and it became known as ‘The 1 lakh car’. For the middle class, both urban and rural, owning a car is a matter of pride and self-esteem. So, rather than gladly discovering that this fantastic upgrade from a two-wheeler actually had a reasonable price, Nano’s portrayed image put the product in the situation of being viewed as a compromise , not an upgrade. “Ek prestige view se thodi down hai,” as one respondent expressed it during a transportation related research a few years ago, while another respondent termed it ‘the No-no’. Dangers of letting a low price be the defining feature of your offering! Mr. Ratan Tata gives a crisp explanation in this article , “I always felt the Nano should have been marketed towards the owner of a two-wheeler because it was conceived to give people who rode on two-wheeler an all-weather, safe form of transportation, not (the) cheapest,” Tata said. “It became termed as the cheapest car by the public, and [also] I’m sorry to say, by the company when it was being marketed,” he added. Another problem that the Nano faced was that of high expectations from those who did see it as an end to their transportation woes. During the same transportation related research mentioned earlier, we also found that the same Indian family that would uncomplainingly seat four people on a scooter or bike and balance their shopping bags too, somehow morphed into a demanding set that wanted adequate boot space in their car to keep luggage – just in case they had to drop a relative to the station. The performance problems with the initial batch of cars did nothing to boost Nano’s image either. Soon after the cars hit the road came reports of some of them catching fire, which was seen as an indicator of low quality and a lack of reliability. While only a few such issues were reported, we’ve found that some people still mention these spontaneously when the Nano is mentioned. Here’s where the change begins and the marketing team begins explicitly targeting a different TG – young professionals in urban centers ; you can click on the links here , here and here to view the ads and see for yourself the distinct change in tone and style of ads from the earlier people’s car ads. By now, the no-frills car also had some add-ons such as the ‘best – in –class A.C.’ mentioned in the print ad shown below. This is when an attempt was made to radically alter the Nano’s positioning in order to make it appeal to the new TG of urban professionals. 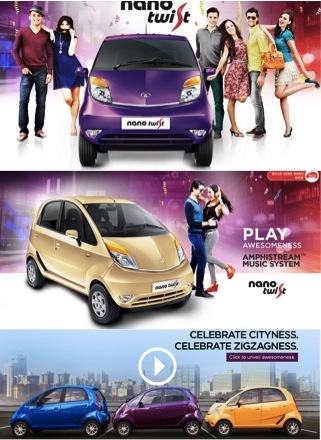 The ‘you’re awesome’ campaign targeted young urban folk and tried to showcase to them the new stylish Nano – new colours, better interiors, a car that could seat a couple of friends , a fun n’ smart car to hang out with. Did it work? I recall discussing this campaign and its effectiveness with a young colleague early last year and she felt that it was having some impact, two of her friends had noticed the ad and actually purchased the Nano Twist. Multiple news reports also mention that the customer profile for the Nano had indeed changed over the years, a heartening sign – the proportion of Nano buyers in the 24 -34 years age bracket had expanded to 40 percent, from the earlier 15 to 18 per cent. Another interesting change happening in the Nano script is the growing base of women. Today, they account for 28 per cent of its customers, a substantial jump from 12 per cent in the earlier ‘people’s car’ phase. That’s only part of the story though; take a look at the sales data for the rest – as per this article, in the April – December period of ’14-’15, Nano only sold 13,333 units, down 18.64% from the same period of ’13-’14. What could have limited the impact of such a high decibel campaign? Well, one reason could simply be that the impact of the initial launch advertising and PR campaign in ’08-’09 was so strong that the ‘cheap car’ story could only be over-written over the long haul , and it’s not a task that one ad alone could shoulder. Another could be that while the ‘You’re Awesome’ campaign did have a smarter , more stylish feel to it, there was no over-arching product story communicated about how the Twist was better than the earlier version of the Nano, neither about how it was better suited to city travel than other cars. While some shots in the ad did imply easy maneuverability, it was not explicit enough, and got overshadowed by the messaging on style and aesthetics ; the ‘smart city car’ benefits were explicitly mentioned only in print ads. When a repositioning as drastic as this one is being attempted, consumers probably need to hear that the car has improved significantly too. And thus to the eagerly awaited launch of the Tata Nano Gen X later this month! Now clearly aiming for the ‘smart city car’ tag, the Gen X has a host of improved features, see details here , here and here.